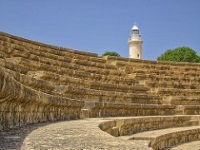 Near the modern Paphos Lighthouse is the Cypriot Acropolis, a complex of ancient buildings which includes a 2nd century Roman odeon restored and now used for summer orchestral and stage performances. South of the odeon are the remnants of the Roman Temple of Asclepius, the god of medicine, and north of the lighthouse are the ruins of the ancient town walls. One of Cyprus's world-renowned ancient treasures is the stunning set of mosaics of the acropolis near the harbour. These incredibly well-preserved artworks often top the list of Cyprus attractions and have been delighting visitors for decades.